With the Kodi Champion Sports addon you get access to lots of live sports events. Some of the streams in this addon prompt you to download the Kodi SportsDevil addon. I haven't had much success with these, despite having it installed, but just in case, you might be interested in our guide to install SportsDevil on Kodi. This addon offers some streams that need the f4m Kodi addon. This one is automatically installed when you install Kodi ZemTV addon, so that would actually be a good chance to get two channels with the best sporting events and live TV streams without having to worry about additional addons. If you install Kodi Champion Sports addon, I recommend you use a wireless HTPC keyboard, to add to the comfort of your setup and browse your streams better. How to install Kodi Champion Sports addon? This addon needs to be installed from a .zip file. This means it will not update automatically. Installing addons from repositories such as SuperRepo Kodi addon repository, or using the Fusion Addon installer, ensures automatic updates. 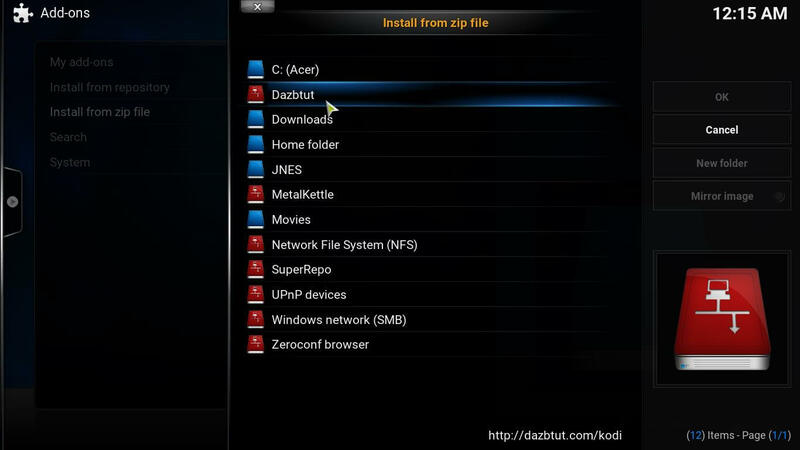 Add the dazbtut source to your Kodi device by going to System -> File Manager -> Add source. Use the URL http://dazbtut.com/kodi and assign it the name Dazbtut. Click OK.
Use the provided information to fill the dialog that appears, and press OK.
After adding the source, it's time to install the Champion Sports Kodi addon. Head back to the Kodi main page by clicking on the house icon. To install Champion Sports Kodi plugin, go to System -> Settings -> Add-ons -> Install from zip file. On the dialog that appears, click on the Dazbtut source, previously added. Click on the Dazbtut source you just added, to get access to the addons available from there. This source has three folders inside. Click on addons and a list will appear. Scroll until you find plugin.video.Champion Sports.zip. Click it and the Champion Sports Kodi addon will start downloading to your system. Find the .zip file for the Champion Sports addon and click it. After a few moments you should see a success notification like the one below, at the bottom-right corner of your screen. This means you did successfully install the Champion Sports Kodi addon. You will know the addon was successfully installed when you see this notification on the bottom-right corner. Congratulations! You successfully got the Champion Sports Kodi plugin on your system, and now you're ready to stream all the sports events it brings! If you want to watch the Rio 2016 olympics, you can do so with the 10 best addons to watch Rio 2016 Olympics, or you could learn other methods to watch Rio 2016 Olympics with our basic guide to ensure you never miss an event!